Bucket List Accommodation – Hotels you’ll want to book Right Now! Great accommodation can make or break a holiday. It’s a good thing then that we’ve taken the guess work out of your planning and have found the most amazing, unique and gorgeous accommodation around. All you need to do is decide which ones will make it to your personal bucket list! These anything-but-ordinary accommodation options make the most of their stunning settings. Adventure is calling – will you answer? Located just 30 minutes from Seattle, Treehouse Point is home to six gorgeous and unique tree houses. Tucked away amongst the forest and dotted the edge of their stunning pond, guests have all the comforts of home in a setting anyone would envy. The hardest part is figuring out which cabin you want to call your own! Few places make you work so hard to get to your accommodation and fewer still grant the peace and serenity found at the Gibbon Experience. Guests zipline in and out of their tree houses amongst the lush South-East Asian jungle and spend their days exploring the vegetation below. What will you spot from the treetops? With its own private skifield (and 7km worth of runs) along with dogsledding and paragliding onsite, Whitepod’s activities are just as amazing as the accommodation itself. Open year-round, your adventure starts from the moment you check in during winter as you’re provided with a map, headlight, snowshoes and talking sticks before being sent on your way! The pods are located an easy 20 minute walk from the main reception, ensuring the curious passers-by don’t spoil the peace and quiet. Whitepod is a haven for everyone that loves the outdoors. The original igloo hotel, Kakslauttanen is right up there as a bucket list hotel for many. During winter, guests can sit back, marvelling at the northern lights as they work their magic in the endless night. During the summer, visitors make the most of the ever-present sunshine, exploring their natural surroundings. With different levels of price (and comfort), you may be surprised by how attainable a stay here can be. Imagine glass encompassing you as you lay surrounded by nothing by farmland and endless starry skies. Now stop imagining and get yourself to Aotearoa! Purepods have three glass cabins strategically placed around the South Island. Each come equipped with a BBQ to cook up a good-old-fashioned Kiwi feast along with a telescope and bluetooth speaker to allow you to unwind in style. 360 degree views? Yes please! Perched 400 metres above the Sacred Valley of Cuzco, you’ll find these transparent luxury capsules. Getting there is half the fun! A via ferrata or hike and zipline course awaits all potential guests and once you’re tucked in for the night there’s no going back. Fortunately, guests are treated to a gourmet dinner and breakfast along with one-in-a-lifetime views, so there’s really no need to go anywhere. If there was ever a hotel worth braving the cold for, this is surely it. Carved fresh each season based on designs created by a team of artists, the Icehotel really is an ever-changing work of art. Warm blankets are provided as is a toasty lounge space so guests can hear themselves up before hunkering down for the night. There’s nothing like a good pampering session. These hotels and glampsites do such a great job of treating their clients to something special you might never want to leave! Nothing makes a hotel quite like a breathtaking pool and they don’t come much better than the dual infinity pools at the Hanging Gardens of Bali. Set amongst the jungle, this pool is absolutely magical, as is the service guests receive. Make your inner animal lover happy with a memorable stay at the iconic Giraffe Manor. This beautiful, stately homestead oozes luxury but nothing could outshine what makes the manor truely unique. On multiple times throughout the day the resident Rothschild giraffe herd swings by the manor to say hello to guests. Not content with staying outside though, these curious giants poke their long necks into the building, on the hunt for a treat. It’s hard to believe a place like this exists! If you’re looking for a more affordable option, you can still have an up-close-and-personal visit with the local giraffes at the Giraffe Centre – we highly recommend a stop there in Nairobi. With the sun setting on an incredible day of game drives, can you imagine much better than snuggling up in a warm bath, watching the local elephants making themselves at home? With private chefs on hand to whip up anything your heart desires and a dedicated team of smiling staff, each determined to show their guests the time of their lives, Kulu Safaris is so much more than a glamping site. By day guests are treated to game drives where leopards, elephants and sloth bears are just waiting to be discovered, whilst during moments of down-time, the Kulu Safari team are on hand with cold beers and warm, welcoming smiles. Could you see yourself soaking in this tub? Tasmania’s crisp ocean air lapping at your face whilst the waves below crash against the shoreline? Did we mention, you’ll have 5 kilometres of beach all to yourselves? It sounds like absolute bliss, doesn’t it. Just wait until you turn around and spot the incredible private homestead behind you. It doesn’t get better. This stunning hotel is located on the edge of the largest sand desert in the world, Liwa Desert. Just over an hours drive from Abu Dhabi, the capital of the UAE, this hotel is both remote and easily accessible. Whatever you do, be sure to get out of the city for a desert adventure whilst you’re visiting Dubai or Abu Dhabi! Bucket-list-worthy experiences aren’t exclusive to high-fliers! These unique options will wow you without doing the same to your wallet. A hostel in a plane? We’re not kidding! If you’re in Sweden and are looking for a memorable experience, book a bed in this decommissioned 747-200 Bowing jetliner. All-inclusive resorts aren’t normally music to the ears of independent travellers but Borderlands surprises in all the right aways. Perched alongside the Kelani River, each room offers incredible views out over the river. Don’t be surprised as you marvel at fireflies drifting through the night and spot chameleons sunning themselves as you eat breakfast. 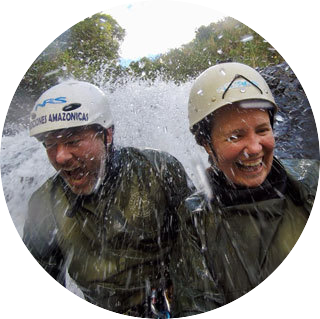 Each day the team at Borderlands will whip up delicious meals and take you out into the local community for a range of adventure activities – whitewater rafting and kayaking, canyoning, mountain biking – this incredible eco lodge does it all. Incase you missed the memo, Guatemala is home to one of the most unassuming little slices of paradise you’ll find anywhere. A short walk from Greengos, a delightful eco lodge, you’ll find the marvel that is Semuc Champey – after spending the way swimming, hiking and just generally marvelling at nature, head back to the lodge for an evening besides the river. It’s impossible not to fall in love with the depths of the Guatemalan jungle – we dare you to try. Thank you to each of the hotels, Infinite Legroom, Expert Vagabond, Delta Lighting Solutions and Be a Secret for providing pictures where we did not have our own. This page does contain affiliate links – should you choose to book some of these rooms through the links provided we may receive a small payment to help us keep Exploring Kiwis. There is absolutely no additional charge to you for this – thanks so much for your support! This entry was posted in Accommodation, Wishlist. Bookmark the permalink. I just wanted to let you know that I nominated you for the “Blogger Recognition Award” – because your blog is awesome! Here is a link to the announcement post. These are all incredible! I want to stay in every single one, but especially Giraffe Manor. How incredible would that be?! That’s it I’ve packed my bag and I’m ready to go! So many amazing places to escape reality and relax in. Wow! There’s so many places that have rocketed straight to the top of my bucket list. Would probably be a bit chicken for the sky room in Peru though. Awesome tips.